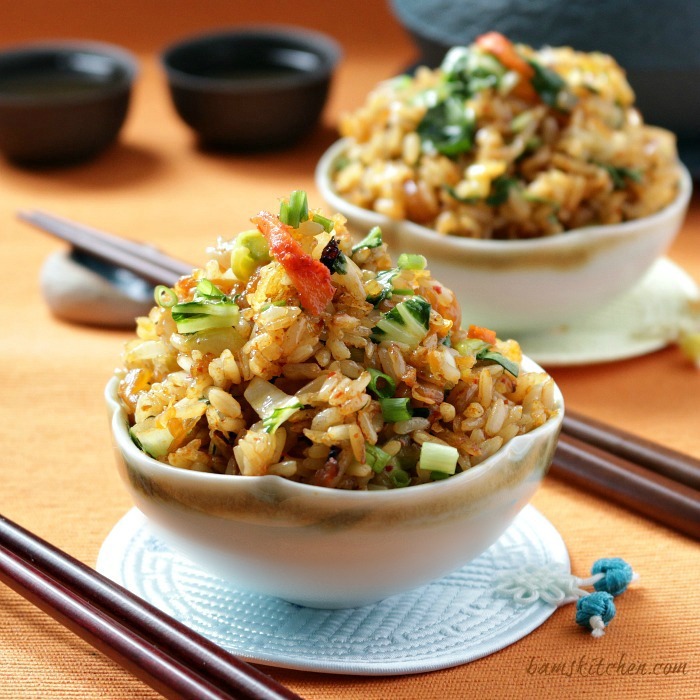 Kimchi Pantry Brown Fried rice is a 6 ingredient little wonder packed full of delicious spicy, sweet and savoury flavours while using up your pantry ingredients. Have you met Kelly from A Side of Sweet? 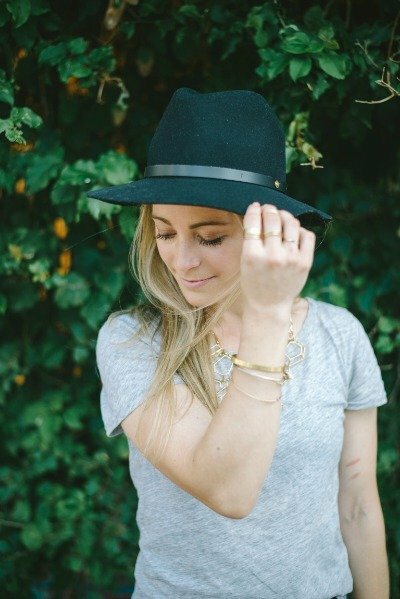 Kelly is a pediatrician and also hosts a lifestyle, food, fashion, travel and DIY blog in San Francisco. 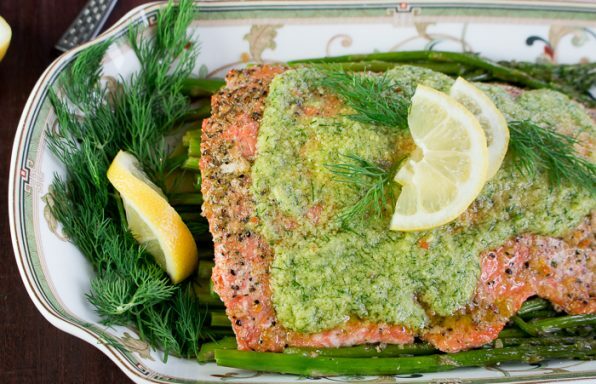 You are just going to love her site as it is packed with fantastic healthy recipes like her Grapefruit sorbet, Healthy Butternut and Squash Dip, and her delicious Edamame and Kimchi Rice Recipe which I am going to make for you today. Please stop by A Side of Sweet and say hello. I have met a fantastic group of lovely bloggers on Facebook (Food Bloggers Central) and we have decided to do a blog hop to introduce you to some new faces and of course some delicious recipes. 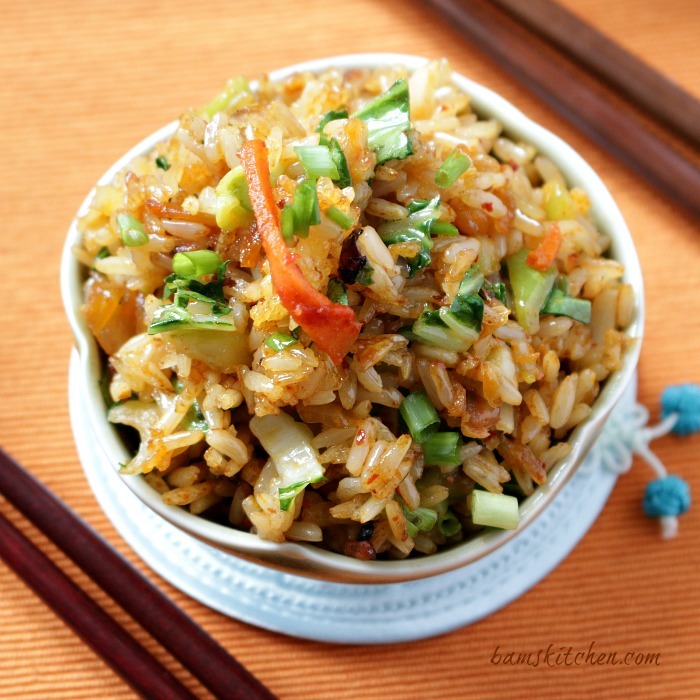 You are going to just going to love how quick and easy this Kelly's Kimchi Fried Rice recipe is to make. 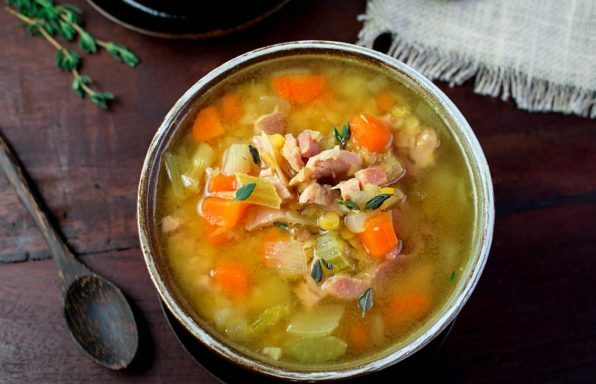 You are also going to love this recipe, even more, because it is a great way to use up all of those bits and bobs of refrigerator veggies that are looking for a new home. I had purchased a lifetime supply of kimchi in my refrigerator because of the big sale to celebrate "Korean Food Week" at the local "Park-n-Shop" here in Hong Kong. This was the perfect recipe to use up some of the inventory. 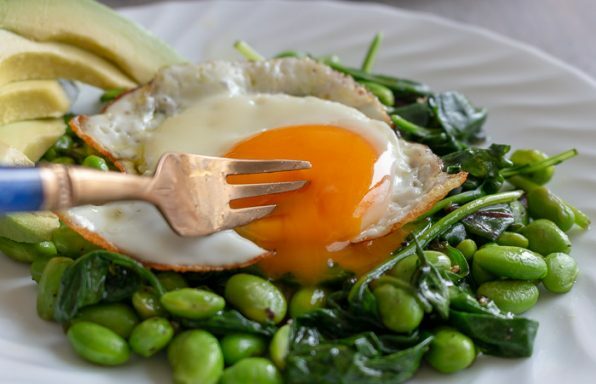 I did not have many of the items that Kelly used in her recipe (edamame, onions, etc) here at home so had to make some exchanges and deletions but the results were amazing even with just 6 little ingredients. Yes just 6 little ingredients for an Asian inspired recipe!!! This recipe is happily gluten-free, vegan, dairy/lactose free and a super affordable way to fill up your hungry family and friends. 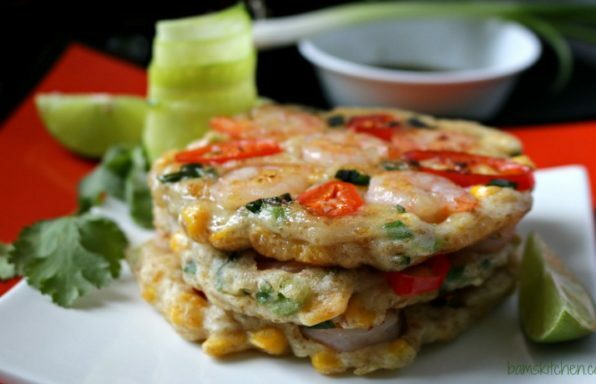 I know that you too can do wonders with this recipe just using what you have at home. 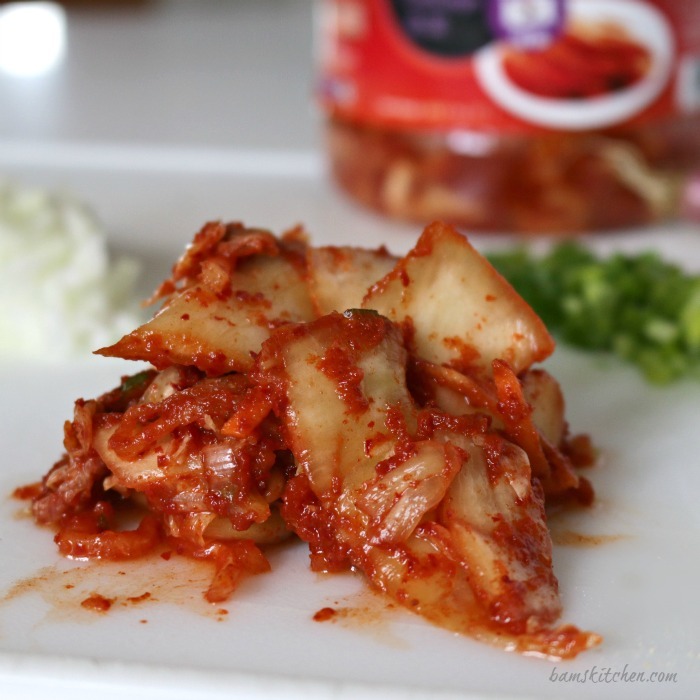 Kimchi is what I call the perfect fermented food. Kimchi is great for your health as it has many nutrients, it also helps keep a normal flora in your gut to keep it happy and the best reason of all is that it tastes absolutely delicious. It also has everything in it that you might want to add in a stir fry like tons of garlic, carrot, onions, so you don't have add it again to the recipe, unless you want to. Do not worry if you do not like spicy food but something amazing happens when you stir fry kimchi. It is magic as it goes from a spicy sour fermented cabbage to sweet and slightly spicy kimchi. The cabbage and veggies sweeten slightly when you stir fry them. I never knew this until I started experimenting with it here at home. I live in Asia and it is no shock that I make fried rice almost every day. After all, I have to make something to fill up the team here on the home front. 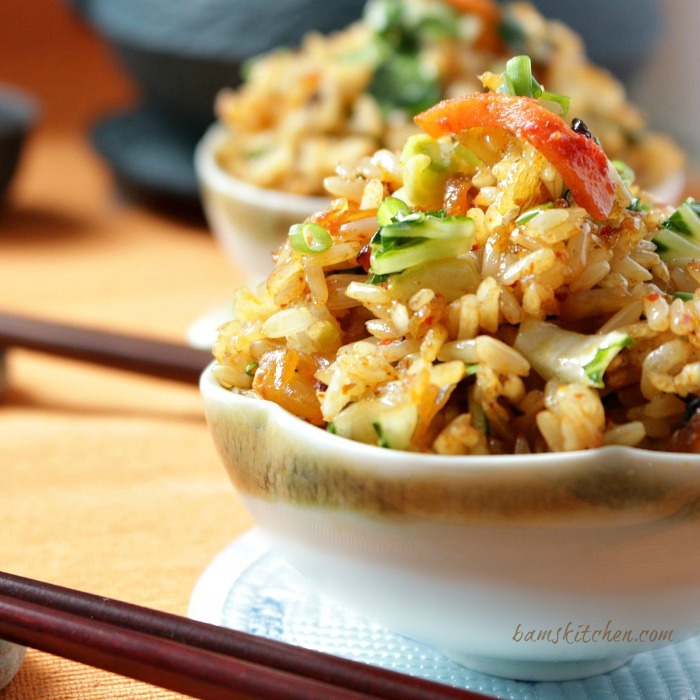 Do you remember by Pantry Fried Rice recipe from a couple of years ago? 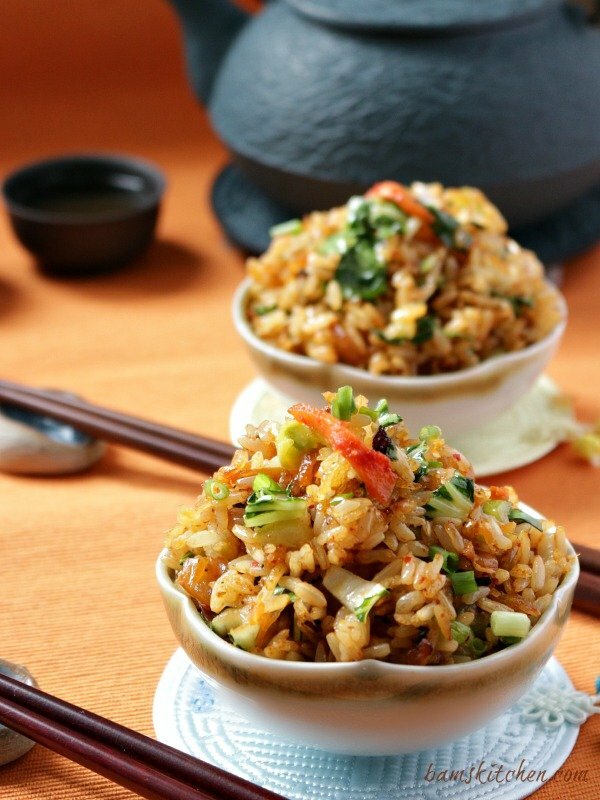 It will take you through step by step all of the specifics to help you make perfect fried rice in your own home. I changed up a couple of steps in Kelly's recipe as my boys like their fried rice very dry and almost crunchy. It is a texture thing and I think you will like it too. I stir fried my kimchi first to get it nice and dry and then I added the rice and other ingredients and this worked like a charm for me. Next time, I can't wait to try it with the addition of edamame beans. 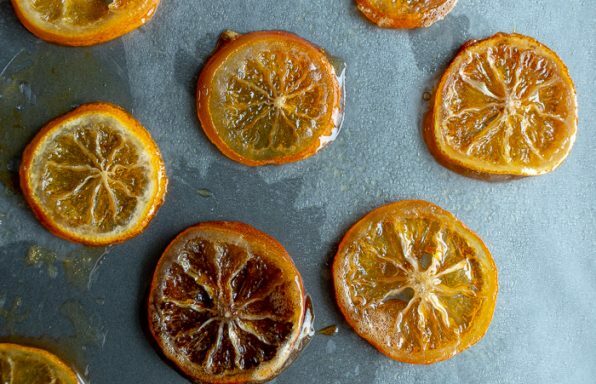 A special thanks to Kelly from A Side of Sweet for a super delicious recipe. 1Place oil in wok/pan and het on medium heat and add your kimchi to the pan and stir fry for 3 minutes or until all of the moisture is gone. 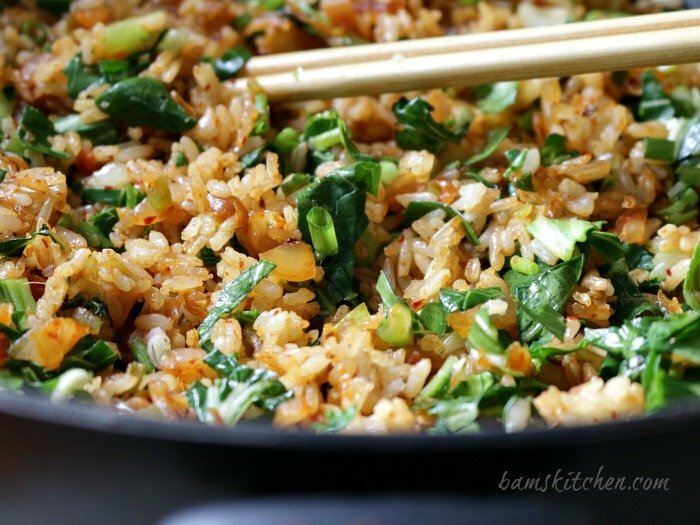 2If you have soft leafy vegetables (like bok choy, cabbage, spinach, or edamame to add to your Kimchi pantry fried brown rice, please move on to step 2. 3If you have hard veggies (like carrots, celery, green beans, etc) that you want to use up from your pantry, you will need to stir fry these first before adding to the rice. I usually add just a couple of teaspoons of water to pan with my veggies and a lid for just a minute to help steam those firmer vegetable and then remove the lid and stir fry until veggies are dry. Please consult my Pantry Fried Rice recipe for details. 4Add your day old brown rice (or white rice if your prefer) to the wok/pan and cook until all the rice has been coated well with the oil, all the rice is separated and mixed in with the kimchi. Stir fry about 3 minutes. (OPTIONAL: Our family likes the rice a little crunchy. If you like your rice crunchy, you can accomplish this 2 ways... 1) Fry the rice a little longer in your wok 2) When cooking your rice on the stove top, actually cook it a longer longer until the rice actually starts to stick to he pan but do not burn it. You will have lots of crunchy rice that way. I know it seems kind of odd but my family just loves it that way. 5Season your brown rice with salt and white pepper to taste. 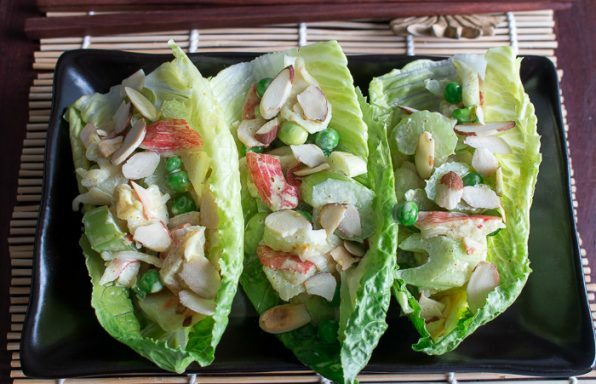 Add chopped baby bok choy, edamame, or any other little vegetables that you need to use from your refrigerator. Stir fry for another minute and then add chopped green onions and mix well. 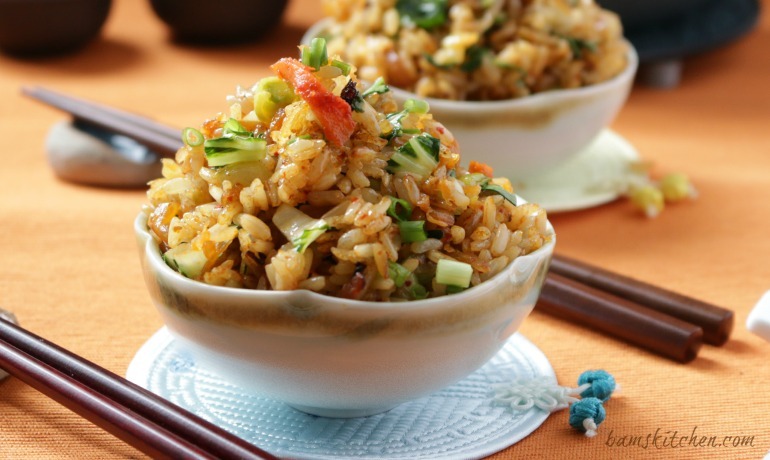 Remove the Kimchi Pantry Fried Brown Rice from the hot burner. 6Serve your delicious Kimchi Pantry Fried Brown Rice in a bowl and if you want you can garnish with a fried egg on top and enjoy. 7This makes 2 small servings or just enough for 1 really hungry adult and can be stored in the refrigerator for up to 3 days.